But, to be specific... we gladly accept Cash, checks, traveler's checks, and all major credit cards (ie. MasterCard, Visa, Discover, Amex). We also accept (actually we prefer them to credit cards) ATM debit cards. 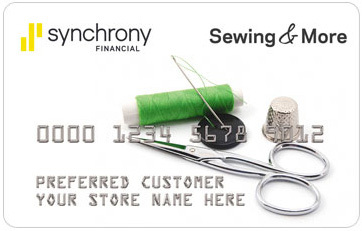 With a Sewing & More credit card, you can enjoy 6 Months No Interest Financing on purchases $150 or more or 12 Months No Interest Financing on larger purchases EVERYDAY! * We often have promotional terms up to 36, 48, or even 60 months on select items or brands. We will gladly ship immediately (within the continental United States) any order paid by credit card (sorry, but to avoid fraud the billing and shipping information must match). We do not ship internationally. We will ship orders paid by check on the clearing of the check. Sorry, no C.O.D orders.